Happy Friday the 13th! 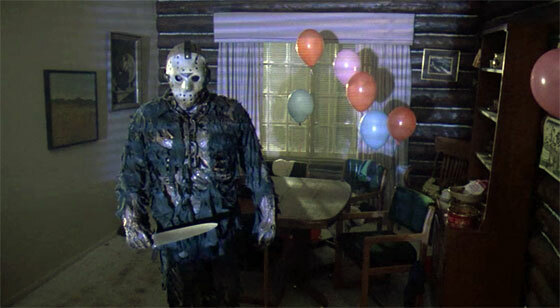 Today is the perfect time to take a journey back to Camp Crystal Lake and celebrate one of the greatest slasher franchises of all time, which helped to define an entire generation of horror, for better or for worse. Friday the 13th premiered in theaters in the summer of 1980. It was a pretty cheap little horror movie, costing just over $500,000. Critics basically hated it, trashing the movie as a cheap, exploitative gore-fest with little to offer. However, little did they know that this simple, low budget movie would go on to become one of the most successful horror franchises of all time, with Jason Voorhees immediately becoming an icon of the genre. Two years prior, Halloween helped kick start the slasher genre, and Friday the 13th helped build upon that and popularize it even further. No matter what you think of the series, it’s hard to deny that the franchise completely changed the shape of horror for decades to come. Like a lot of these franchises that go on for a long time, the history of the series is pretty strange to say the least. What started as kind of a simple horror thriller about a woman who goes insane after the death of her son eventually descends into a movie featuring that son being sent to space to kill people. In total, the Friday the 13th movies have grossed nearly $400 million at the box office, and the franchise is about to make a comeback. After a six year absence, a new Friday the 13th reboot is in the works, scheduled to be released next year according to Deadline. It was a huge missed opportunity not to release the 13th movie of the franchise on Friday the 13th 2013, but hey, at least the movie is finally happening. Not only that, a Friday the 13th TV series is also in the works. Yes, another one. Though the franchise may have attempted to kill off Jason in the fourth movie in 1984, it doesn’t seem like Jason will ever die. In celebration of the holiday, and in preparation for a new generation of Jason, let’s take a look back at this crazy franchise, going through each movie from worst to best and taking a look at all the highs and lows. And believe me, there are some lows. Let’s start with what has got to be the worst of the franchise and the ultimate sign of a series that has run out of ideas. After dying yet again in the eighth movie, Jason Goes to Hell decides to go the possession route for some reason. In this one, Jason can apparently come back to life by possessing a victim and coming back through a member of his blood line. It’s pretty dumb and kind of a complicated way to bring Jason back, when audiences were really fine with Jason just straight up rising from the grave at the beginning of each movie because he’s a zombie after all. The sequel is lacking many good kills and it just sticks out like a sore thumb compared to the rest of the series. Maybe a movie showing Jason literally going to hell and slashing the hell out of Satan and Hitler would have been cooler. The movie also makes a weird decision to suddenly have Jason be super famous, appearing all over the TV and being hunted down by the FBI. This isn’t exactly unrealistic, but part of why Jason is so cool and scary is that he’s like an urban legend, something you tell a story about over the campfire and you wonder if he’s still out there. This movie basically turns Jason into an average serial killer on the loose, which isn’t nearly as interesting. The movie really doesn’t fit in the franchise at all, and after this one, sending Jason to space was actually a breath of fresh air. Friday the 13th: The Final Chapter was meant to be the end of the series, obviously, and the movie actually kills off Jason at the end for real. It seemed like a definitive and relatively satisfying way to end the franchise, so it must have been really weird to see Part V hitting theaters the very next year. It’s not even like they waited a few years before bringing the franchise back. Nope, the very next year, audiences saw a sequel to the movie. A New Beginning also kind of sticks out like a sore thumb in its own way, though it at least adheres to the Friday formula for the most part. It has its moments and tonally fits in with the rest of the franchise, but the ending is what ruins it. As it turns out, we haven’t been watching Jason this whole time: the masked killer was actually a guy named Roy Burns, and Jason is still dead. Like Halloween III: The Season of the Witch tried for the Halloween series, A New Beginning hoped to take the series in a new direction. Instead of having to keep killing Jason and bringing him back, eachFriday the 13th movie would feature a new killer. But A New Beginning, instead of feeling like a fresh new direction to take the franchise in, felt like it was tricking audiences into theaters to see Jason but instead giving them a movie about some generic killer who they don’t care about. Naturally, audiences were pissed off to see a Jason movie with no Jason in it, and so he was brought back the very next year. Now, A New Beginning seems like a pointless distraction in a marathon of the series. I kind of love Jason X just because it’s so insane to me that the series actually went in this direction and that this movie actually got made. After nine sequels and after Jason Goes to Hell kind of sucking, they actually sent Jason to space. It sounds like a 30 Rock joke, but it really happened. Taking place in the distant future, 2010, Jason is captured by the U.S. government. They basically run out of ideas for what to do with him because he just won’t die, kind of a metaphor for the creative process behind this series, and so they decide to place him in a frozen stasis. That’ll fix everything, right? Way later, in 2455, Jason is discovered and brought on to a spaceship and he starts killing everyone on it. Whereas most of the movies take place at or near Camp Crystal Lake so there’s a reason for Jason to be killing everyone, here Jason is literally just a dude who kills people with no real goal in mind. As someone who grew up in New York, I was pumped to see Jason Takes Manhattan. The idea of Jason being set loose on New York City sounds like such a cool idea, and it could have made for one of the absolute best Friday the 13th movies. As it turns out though, a more accurate title for the movie would have been Friday the 13th Part VIII: Jason Goes on a Boat On Its Way to Manhattan. Just about the entire movie takes place on a boat that’s headed for New York, and we get to know the passengers and watch as Jason sneaks around the ship and kills people. It’s entertaining, and the idea of being stuck on this boat with a masked killer is kind of cool, but the movie never ends up being as tense as it could be. Jason just isn’t as scary when he’s not in the woods, and he somehow seems easier to manage in a location like a boat where he can’t just sneak away into the trees. Instead, the movie just has a handful of funny moments and kills, the highlight being when Jason actually does get to Manhattan. Unfortunately, this section lasts about 10 minutes before Jason is unceremoniously killed by toxic waste and the movie ends. Pretty lame, but we all know he’ll be back next year. In the very first sequel, we begin to see the future of the franchise taking shape. As we’ll get to in a bit, the first Friday the 13th movie doesn’t even have Jason in it. It’s all about his mom, who kills the camp counselors to avenge her son, Jason. The first movie ends with a rotting Jason jumping out of the lake, and though it seems to be a dream, the movie ends with the idea that Jason is still out there. It was a last minute idea, thrown in to give the movie one last scare, but little did we know that this would become the premise of Part II and of the entire franchise. In Part II, Jason does the killing of the camp counselors himself. It’s honestly way cooler and scarier than the first one, though the original has more suspense since we don’t know who the killer is until the very end. This time, Jason takes on that classic urban legend feel that kids talk about around a campfire, which is way more interesting to me than a crazy woman who kills people. Jason doesn’t have his hockey mask yet, so instead he wears a bag over his head. It’s kind of frustrating now, because we obviously want to see Jason looking like iconic Jason, but there is something kind of creepy about how simple he looks with the bag, like absolutely anybody could be under there. In Part III, the series really settles into its groove and becomes the Friday the 13th we know. It’s mostly the same sort of thing as the last one, again with a whole new set of teenagers except for Alice, who is killed off in the first scene. I always found that to be pretty frustrating when a character spends so much time fighting the killer and makes it to the end of the movie triumphant, only to be killed off in the very next movie. Jason finally puts on the hockey mask this time around and instantly becomes one of the most visually distinctive horror characters ever. This one doesn’t have a whole lot to the plot, just giving us another set of characters who go to the lake and get killed, but it’s still a pretty fun sequel. What’s rough about watching this movie now is that it was originally filmed and released in 3D, coming out at the time when the 3D fad was back in full swing. The experience of watching it at home in 2D means a lot of watching people point things into the camera pointlessly, but that kind of gives the movie a goofy charm to it. Just check out these opening credits, with an awesomely cheesy theme song and the titles flying at the camera. It’s total 80s horror goodness, and maybe the first example of the series just trying to be fun rather than scary. The ninth installment in the franchise, Jason Goes To Hell, was pretty disappointing, but one moment made it worthwhile. In the final scene we see Jason’s hockey mask being dragged away by Freddy Krueger’s glove, teasing a mashup movie with the Nightmare on Elm Street franchise. Taking the two biggest slasher franchises of the decade and putting them together was an awesome idea, but we had to wait a full 10 years before the movie actually hit theaters. Luckily, it mostly lived up to the hype and it’s a whole lot of fun. The plot is actually kind of complicated for a movie like this, but basically Freddy Krueger has been forgotten about and kids no longer were afraid of him, so he manipulates Jason into killing a bunch of teenagers for him in hopes of inspiring fear in them once again. Wouldn’t they be afraid of Jason though, not Freddy? Is it just general fear that would allow Freddy to come back, not fear of him specifically? Anyway, it doesn’t matter too much because it’s really just an excuse to get the two characters together. Freddy ends up getting pissed off that Jason is taking all his good kills and so the fight that we spend a decade waiting for begins. I kind of expected the movie to involve Freddy and Jason both individually killing people before they eventually fight towards the end, or maybe they fight towards the middle before eventually teaming up, but, instead, they fight multiple times throughout the movie. Sometimes the fight takes place in the dream world and sometimes it’s in the real world, and so, at least in that way, the movie has a good amount of variety to it. Of course, there’s no actual winner in an attempt to not anger either set of fans. In the last fight it appears that Jason wins, but then Freddy is revealed to still be alive in the very closing seconds, winking at the camera. It’s kind of lame to watch them fight so much only for nobody to actually win, but at the same time, the winner wasn’t really what it was all about. This movie is a total guilty pleasure because it’s maybe the most stupid in the entire series, possibly even dumber than Jason X, but oh so endlessly watchable. Trying to spice things up in the sixth sequel, this movie pits Jason up against a teenager with telekinesis. It’s essentially Jason vs. Carrie. I get that after so many movies of the same thing they wanted to spice things up, but seriously, who came up with that idea? It’s a pretty dumb premise, but it leads to a highly entertaining movie, and with an actually good lead protagonist in Tina. The concept breathes some life into the series, albeit really stupid life, while still giving us all the Jason goodness we know and love. Plus, the movie has by far the best death in the entire series, which was so good it would actually be repeated in Jason X. The movie also has a pretty great final set piece. Whereas usually the end of the movie is Jason going after his last kill who desperately tries to flee him, this time he actually is almost evenly matched and it’s more of a battle. In that way it’s pretty different than the typical Friday the 13th movie, but really entertaining in its own right. It might be somewhat controversial to not put the original movie as #1 on the list, but honestly, I think I respect the original Friday the 13th for its legacy more than I actually enjoy it as a film. It’s definitely a good slasher film in its own right, but when we’re taking a look at the franchise as a whole, it’s pretty tame and the series reaches much greater heights. We really have to judge this movie as its own thing and not as a part of the franchise, because really, it wasn’t trying to be the beginning of a franchise. It’s just a horror thriller about a bunch of kids being stalked by a mysterious killer, and a lot of what we love about this series develops organically over the course of the sequels and isn’t present here. As a film, the original Friday the 13th may be the most well made, but in a re-watch of the series, it’s not the one I get excited about seeing again. It does its job as a thriller, but doesn’t reach any incredible heights. I’d rather have an insanely silly Jason movie that’s really fun, like some of the rest of this list, than a classic like this which, in retrospect, is pretty standard. The movie is undeniably a classic and very influential though, even if it’s definitely not the best Jason movie and not the one I’m quickest to recommend. The original Friday the 13th is undeniably a classic, but the remake is everything I want out of a Jason movie. The original might be more well made as a film, but if I’m given the option to watch the 1980 version or the 2009 version, if I’m being totally honest, I’m going with the 2009 version. It’s a shame that the Friday the 13th remake didn’t catch on, because it was probably as good of a modern Jason movie as we were ever going to get. After the series had spiraled out of control with Jason Goes to Hell and Jason X, this movie brings us back to basics, and there’s something so refreshing about being back to just Jason in the woods again. What I love about this movie is that unlike the disappointing Nightmare on Elm Street remake, this movie doesn’t just redo every scene from the first movie. Instead, it combines a bunch of the plot from the first three movies but also does its own thing, not emulating any moments from the original series exactly. In contrast, the Nightmare on Elm Streetessentially just redid all the famous moments from the original, and what’s the point of that? While for the most part it’s just standard slasher fare, the movie does actually make some bold moves, like with the amazing opening sequence, by far the best part of the movie. *Spoiler alert* The movie sets up a group of teenagers that appear to be the main characters of the movie, and things seem to be going along as we would expect it. Then, before we know it, Jason kills every single one of them, and the “Friday the 13th title card pops up over 20 minutes in. Then the movie basically starts over and we’re introduced to the actual main characters of the movie. I couldn’t help but laugh when I first saw this, and I love the way the movie plays with our expectations like that. It’s interesting and creative for a horror remake, and that alone gives me a lot of respect for this movie. It’s a shame we never got a sequel to it and that the upcoming film is said to be another remake, because this movie lays the groundwork for a new franchise pretty well. Jason Lives makes absolutely no attempt to hide what it is: pure, unadulterated horror trash. After the franchise killed off Jason for real and the last movie didn’t have Jason in it at all, audiences were so pissed off that the character was brought back in Part VI. They could have tried to come up with some complicated explanation for why he’s back, like that the Jason in Part IV wasn’t really Jason, or maybe some curse allows him to transfer his life to another body or something. But no, instead the opening scene of Jason Lives features Jason’s body being dug up and struck by lightning. For a completely unexplained reason, this lightning bolt brings him back, and then we cut to the opening credits which, for absolutely no reason at all, is a James Bond parody. It’s absolutely ridiculous, but they know exactly what they’re doing. The first five movies kind of attempted to be a legitimate horror/thriller series, but by Jason Lives, they’ve embraced the madness and fun that this series can be. The movie also brings back Tommy from the original movie, this time as an adult, and it’s nice to see a character carry over between sequels whereas usually every movie features an entirely new cast. Jason also has kind of a new look to him in this one, appearing even more zombie-like and fierce than ever before. He’s a little more slow and methodical with his kills now, which is how we typically think of Jason today. The movie is one of the best of the franchise, combining the typical camp counselors getting killed formula with a bit more of an overarching storyline, with Tommy being almost a Dr. Loomis type figure trying to stop Jason. Intended as the last installment, The Final Chapter goes all out, and it’s definitely my favorite of the series. This time around, we follow two sets of characters as Jason stalks two cabins in the woods. One consists of the typical group of teenagers, and another consists of a family with the only child character of the series, Tommy (Corey Feldman). This gives the movie more variety than any of the others, and the horror special effects kid Tommy is a lot of fun to follow throughout the movie. It’s basically the typical Friday the 13th structure, but displaying the best of everything the franchise has to offer. It has some of the best kills, the best special effects, the best portrayal of Jason, and the best characters. Crispin Glover’s Jimmy is one of the most entertaining characters of the series. He’s completely goofy and fun, as evidenced by his famous dancing scene which seems to exist in the movie for absolutely no reason. In the end, the movie attempts to kill off Jason for real as Tommy shaves his head and kills him. It’s kind of lame to see Jason go out in such an anticlimactic way, but seeing Tommy going absolutely nuts on him is great. The movie ends implying that Tommy is on a path similar to Jason and will grow up like him, potentially setting up a new series or more sequels following Tommy instead of Jason. We do end up seeing Tommy again as a main protagonist of the next two movies, but he never ends up becoming a new Jason. Still, it’s interesting to imagine how much different this franchise could have been if they had gone in that direction, and how different horror might have been if this truly had been the final chapter. February 13, 2015 in All Movies, Horror Movies.